This lens was strangely introduced at the very end of the Rangefinder Era in 1960. It's very small and light, reminiscent of Leica's famous 105 Mountain Elmar of the 1930's. The 105mm f/4 is the lightest portrait lens made for the Nikon Rangefinder System. 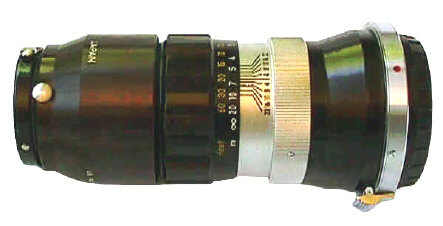 Low production produced a collector's lens which is hard to find today. Some sources claim that this lens was developed for the RF system, and then transplanted to the Nikon F. I have a hard time believing this, since both lenses were introduced a the same time. In fact, the Nikon F lenses start with an earlier serial number range than the Nikon Rangefinder lenses! Both mounts use the same shade and front cap. The lens (either mount) use the same lens case with a cut out in the top for the small lens head. Some claim that this optical design is identical with the later 105mm f/4 short mount for the Nikon F. Well, if you held these two designs in your hand, the different element size would quickly convince you otherwise.